IPL 2018 RCB Jersey: Royal Challengers Bangalore players having two jerseys, one for home games and another one for away games. At their home matches, they will be worn Red (max.) and black color jersey. But, they will have a Black (max.) and red combination in their seven away games. So, we can easily find the game if we unknown about that match by using RCB jersey whether it is their home and away match. Also, the team playing one game each season with a green jersey. The skipper Virat Kohli and his teammates will don ‘green’ jerseys in their home match in this 11th IPL edition against Rajasthan Royals on April 15 as a part of ‘Go Green’ and ‘made of recycled plastic’. This RCB Green jersey had the combination color of black. On April 8th Sunday, Royal Challengers Bangalore (RCB) begin this IPL 2018 campaign over Kolkata Knight Riders (KKR) at the Eden Gardens in Kolkata (Away game). So, they start this 11th IPL season with their Black and red jersey. 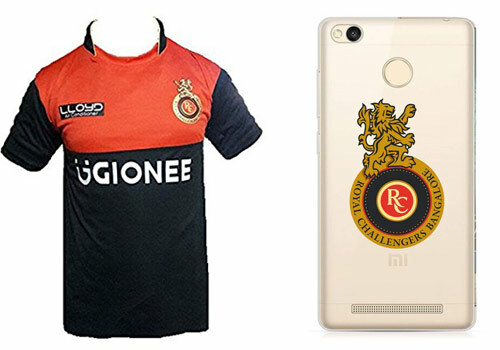 Fans can find RCB jerseys and T-shirts on online stores and also offline retails shops. Visit India’s leading e-commerce websites like Amazon and Flipkart. Search for the following terms such as RCB jersey 2018 IPL, RCB jersey Virat, RCB jersey for boys, RCB cricket team jersey, RCB t-shirt, and more others. But, the result will be one with the collections of RCB team jersey. At the same time, Bangalore cricket fans can buy smartphone back cover with the logo of Royal Challengers Bangalore. Buy Royal Challengers Bangalore Redmi 3S Shockproof Clear TPU Phone Back Cover at Rs 299.00. The thin minimal design is perfect for flaunting your device. Like the same, you can purchase RCB phone back cases for your smartphone in online. Zeven: which is officially associated with ISL, ICC, RCB, All India Tennis Association (AITA), and Red Bull Campus Cricket. So, you can buy new RCB jersey, crew neck tee, Polo tee, unisex RCB cap officially here. Totally 60 matches will be played in IPL 2018. Each team will play 14 league games which divided into seven home and seven away matches. First IPL game will begin on 7th April between MI and CSK. Rcb is best team in ipl . Virat kohli is successful batsman in the ipl .